In the previous pAsuram, AzhwAr mentioned about the lowliness due to birth. Since it was not due to them [the birth was a result of one’s own past karma, yet, after being born, one cannot do anything about it], this could be excused. In this pAsuram, he says that if they carry out wrong deeds which would not be pardoned, they will not have to endure any punishment because of those wrong deeds, provided they have knowledge of mEmporuL pAsuram. அருவினைப் பயன துய்யார் அரங்கமா நகருளானே. mArva – one who is adorning these two (thiru and maRu) on your chest! thirumaRu mArva – the one who has thiru (SrI mahAlakshmi) and maRu (mole, called as SrIvathsa) on his chest! These two will signify that he is the sarvESvaran (lord of all). In SrI rAmAyaNam yudhdha kANdam 114.15, “SrIvathsavakshA nithyaSrI: ajayya: SASvathO dhruva:” ((SrI rAma, who has) mole called SrIvathsa on his divine right chest, inseparable periya pirAtti forever on his divine chest, one who cannot be won over, one who lives forever and one who has unchanging form, nArAyaNan), maNdodhari describes SrI rAma through the above verse and confirms that these two identities (Sri and SrIvathsa) are unique to him. AzhwAr, towards the end of this pAsuram says “they will not experience the result of their deadly sins” by referring to the pirAtti’s quality of vAthsalyam (motherly love) and says here that such pirAtti is always present in his divine chest. Other AzhwArs also refer to her presence in his divine chest, such as nammAzhwAr’s thiruvAimozhi 6.10.10 “alarmEl mangai uRai mArbA” (one who has the divine chest where alarmEl mangai (consort of SrInivAsa) dwells constantly) and periyAzhwAr’s thiruppallANdu 2 “nin valamArvinil vAzhginRa mangaiyum pallANdu” (mangaLASAsanam to pirAtti who dwells in your right chest). While AzhwAr had hidden the presence of pirAtti in mEmporuL pAsuram [hinted her presence through the word un as we had seen in the vyAkhyAyam of that pAsuram], he announces her presence in the beginning itself,in this pAsuram, which speaks about the greatness of those who are fully immersed in that pAsuram [38th]. When emperumAn grants the means (upAyam) to his ASrithars (followers), it is pirAtti who functions in the recommendatory role (purushakAra bhUthai). When he performs the role of master (taking the follower’s service) (upEyam), she joins him in accepting the kainkaryam. Thus her connection is very much required, both in the upAya and in the upEya sthithis (states). ninnaich chindhaiyuL thigazha vaiththu – keeping you in their hearts [mind] as the only upAyam (means) without connection with any other upAyams [such as karma yOga etc]. During gAyathri hOmam (a ritual in which gAyathri manthram is recited) the person will recite gAyathri manthram on the one hand and will feed the agni with samith (stick), thus carrying out two jobs at a time. If a follower does anything himself to attain emperumAn as upAyam, then emperumAn’s nature as being the upAyam will dullen. Thus, AzhwAr says that apart from (1) pirAtti who recommends to emperumAn to protect the follower, (2) emperumAn himself, who is the protector, (3) the prapannan (one who surrenders to emperumAn) and (4) AchAryan, who shows that it is emperumAn who is upAyam and upEyam, nothing else is required. By saying vaiththu we can also consider that it shows the ASritha pArathanthriyam (total dependence of followers) of the emperumAn and pirAtti since they enter the follower’s mind, taking the follower’s thought of keeping them in his mind as their hold. maruviya manaththarAgil – this sequence emphasises the deep faith of the follower in the upEyam (goal). The meaning here is – if the follower renounces all the other goals and holds on only to SrIman nArAyaNan. By using the term Agil AzhwAr indicates that it is rare for any chEthana (sentient entity) to keep firm faith in the upAyam as seen in the sequence sindhaiyuL thigazha vaiththu and firm faith in the upEyam as seen in this sequence maruviya manaththar. mAnilaththu uyirgaL ellAm veruvuRak konRu – Since it is almost impossible to kill all the jIvarASis (creatures), we should not combine the words mAnilaththu uyirgaLellAm with konRu (killing all the creatures in the world); instead, we should combine mAnilaththu uyirgaLellAm with veruvuRa (to be frightened). Thus if even one person is killed, all the creatures get frightened because of the dastardly act. It shows the killer’s proclivity for harming creatures. suttittu – instead of killing them instantly with weapons, torturing them by setting them afire and killing them. Ittiya vinaiyarElum – just as people work hard to obtain an advantage, this person is also working hard to earn sins. Elum – since he couldn’t have done such harmful deeds after obtaining knowledge in mEmporuL pAsuram, this talks about his behaviour before obtaining that knowledge. laghvathri smruthi says “janmAnthara sahasrEshu thapOgyAnasamAdhibi: I narANAm kshINapApAnAm krishnE bhakthi prajAyathE II” (after observing karma gyAna yOgams in tens of thousands of births, for those who get rid of sins (which are the hurdles for the commencement of bhakthiyOgam) , bhakthi towards krishNa begins). SrI bhagavath gIthA 7.19 says “bahUnAm janmanAmanthE gyAnavAn mAm prapadhyathe I vAsudhEvas sarvamithi sa mahAthmA sudhurlabha: II (after several virtuous births, gyAni (knowledgeable person) worships me, saying that “vAsudhEvan is everything (to me)”. Such a mahApurusha (great person) is very rare to see). Again, SrI bhagavath gIthA 6.54 says “prayathnAth yathamAnasthu yOgI samSudhdha kilpisha: I anEka janma samsidhdhas thathO yAthi parAm gathim II” (yOgi [sage like person who meditates deeply] attains high levels after gaining puNya (good deeds) in many births, consequently ridding himself of pApa (sins) and engaging in yOga with his efforts). From all these pramANams (authentic sources) it is clear that such a knowledge and bhakthi (devotion) will come to a person only after many virtuous births. Thus, such bad behaviour [as we had seen a little while ago] will not come to a person even in previous births. Hence by using the term Elum AzhwAr says that even if such a rare event occurs . .
aruvinaip payanadhuyyAr – they will not experience the harmful result of such sinful deeds that they had earned. 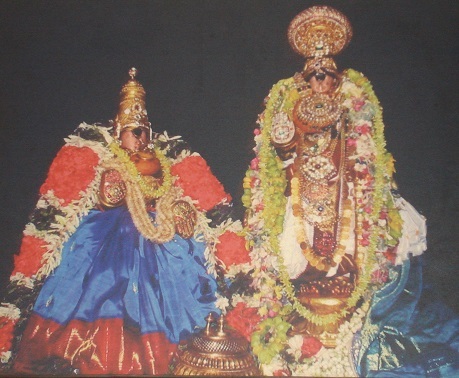 When SrI rAma aimed the arrow at samudhra rAjan (king of ocean), the samudhra rAjan fell at SrI rAma’s feet. Immediately SrI rAma shot the arrow against his enemies in [very far away] deserts. The opinion here is that emperumAn will make the enemies of such persons ([hat we had seen earlier, indulging in sinful deeds like killing, burning etc] to suffer the results of their deeds. SAtyAya naSAkhai says “thasya puthrA: dhAyamupayanthi: dhvishantha: pApakruthyAm suhrudhas sAdhukruthyAm II” ((when the mumukshu (one interested in mOksham) goes to paramapadham, his sons will inherit his wealth; his enemies inherit his sins and his friends, his virtues). Thus, this has been mentioned in vEdha too. Even if it does not happen that way [not experiencing result of sinful deeds], emperumAn will save them, just as he saved arjuna from the nAgASthra of karNa by making arjuna’s crown as the target. He may even experience the results of such deeds himself to save his followers, just as he took the power of bhagadhaththa’s weapon on himself and saved arjuna. Since the punishment for their sinful deeds is emperumAn’s anger, if emperumAn says that he has “tolerated” their deeds, will they [the harmful deeds] not disappear? Hence AzhwAr says that they will not experience the harmful results of such deeds. arangamAnagar uLAnE – the purpose of your coming to thirvarangam (SrIrangam) and lying down here is only to show that you do not do all these things only during the time of avathAram (incarnation) but also to help those who come after the period of incarnation. emperumAn may desire that he gets the name of having protected such people [who commit ghastly crimes as mentioned in the earlier part], but in reality, those who have knowledge of mEmporuL” will not indulge in such acts. It will be clear, without there being a need to mention it, that these people who get scared that even an act of puNya (virtue) carried out with the thinking of upAyam (means) by oversight, will be counted as pApa (sin), will [obviously] not commit sins. In SrI rAmAyaNam yudhdha kANdam 116.44, pirAtti tells hanumAn “pApAnAm vA SubhAnAm vA vadhArhANAm plavangama I kAryam karuNamAryEna na kaSchinnAparAdhyathi II” (hE monkey! Whether a person has committed sin or a virtuous deed, even if he is to be killed, he should be shown mercy by a person with great qualities. There is no one who has not committed an offence). Sitting on his chest, even if such pirAtti who plays recommendatory role to emperumAn on behalf of followers, finds faults with his followers, emperumAn will say “my follower will not do that. Even if he had done that, it must be an act of good” (periyAzhwAr thirumozhi 4.9.2). If we quote this to a person who has only superficial knowledge of emperumAn, he may say “in that case they have to go on indulging in sins”. But such thoughts are incongruous, says the vyAkhyAthA (commentator). We shall now see pAsuram 41. This entry was posted in mudhalAyiram, thirumAlai on December 5, 2016 by T N Krishnan. Please continue to do this wonderful work…. It is a boon to get our great ancestors works in digitized, easy to access format.